The Standards Progression Report displays student performance on standards in two ways: Mastery/Non-Mastery and by Performance Levels. In addition, three report options are available: Latest Assessment, All Assessments, and All Assessments plus Average. 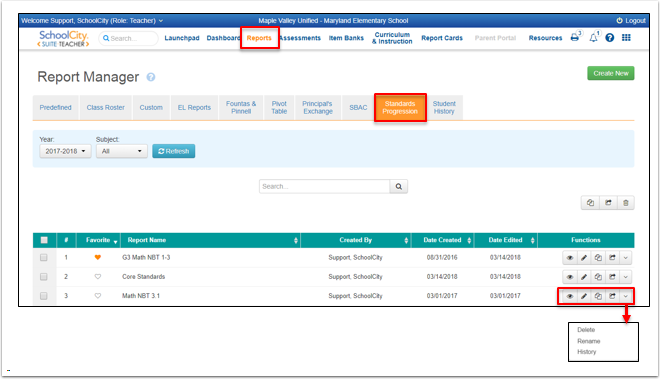 In addition, Users can create a report in the beginning of the school year for selected standards and automatically update the report as future assessments are administered. From the Top Menu Bar, select Reports (Report Manager). In the Report Manager, select Standards Progression . Or, from the Launchpad, click on the REPORTS flip card. On the flipped side, click on the right arrow to see more reports. Select Standards Progression, and then select a previously created report to view, or click on More to go to the list of Standards Progression Reports. On the Standards Progression screen, you can either run an existing report by selecting the View icon (eye) to the far right of the report name, or select Create New to build a new report. Roster: Click on the down arrow next to Roster year to choose a different roster year from the drop down menus. Search filters. Filters will vary depending on SchoolCity Role (Teacher Level User shown). Click Refresh after entering search criteria. Filter Students. View data for specific demographic groups or student groups. View by Mastery/ Non-Mastery (See Step 4-6) or By Performance Levels (See Step 7). View by Mastery/Non-Mastery with a Color Scale (See Step 4). View Time Spent: Check the box to view the average time spent on items within a standard. Leave unchecked to hide the time spent. Mastery Value: If not set and locked by the district, users may set the mastery value as desired. This controls the Mastery/Non-Mastery values and associated color coding. Student Results: ID number, Last name, First name, Grade, (Other columns may have been added during the creation of the report such as teacher, period, demographics), View Charts, Percent Correct for each standard column with color-coding. Select Standards view: Use the drop down to view results of only selected standards. Click Refresh after making selection. Search box: Enter the first or last name of a specific student to view his/her results. Click on the magnifying glass to find results. 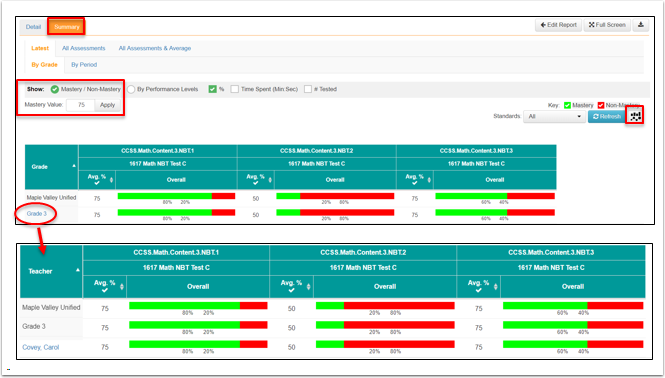 Key: Color-coding for Mastery/Non-Mastery and Performance Levels, depending on the report view. Edit Report: Return to Report setup to edit the report. Full Screen: Expand the report view to full screen mode. Download icon: Export report to PDF, Excel, or CSV. 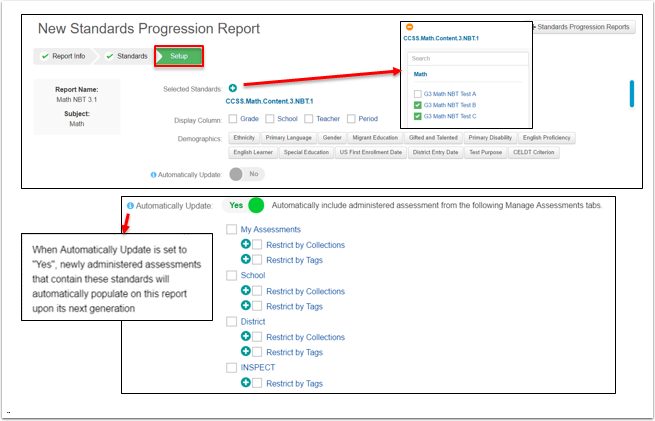 Return to Standards Progression Report list to view a different report or create a new report. Hover over any result to view the assessment name, raw score, and test date. Hover over the standard number to view the standard details. With District permission, users may view results from the Latest Assessment, All Assessments, and All Assessments & Average aligned to the selected standards. Detail: Latest Assessment: Displays performance for the selected standards on the most recent assessment aligned to those standards. Notice the column headers indicate Latest underneath the standard numbers. Mastery/Non-Mastery: Mastery (scores at and above the Mastery Value) and Non-Mastery (scores below the Mastery Value). If not set and locked by District SchoolCity Administrator, the Mastery Value can be changed as desired. Detail: All Assessments: Displays performance for the selected standards on every assessment aligned to those standards; By Mastery/Non-Mastery with or without the Color Scale. Notice how the column headers have changed to show the Assessment Name underneath the standard numbers. Detail: All Assessments & Average: Displays performance for the selected standards on every assessment aligned to those standards and calculates the average percent correct for each standard, By Mastery/Non-Mastery with or without the Color Scale. Notice the addition of a column labeled Standard Average underneath the standard numbers. Key as Filters: Mastery and Non-Mastery can be used as filters (with or without the Color Scale). The default view is for both to display in the student results. View Mastery only results for any assessment choice by unchecking the Non-Mastery box. View Non-Mastery only results for any assessment choice by unchecking the Mastery box. Detail: Latest Assessment: Displays performance levels for the selected standards on the most recent assessment aligned to those standards. Notice the column headers indicate Latest underneath the standard numbers. Detail: All Assessments: Displays performance levels for the selected standards on every assessment aligned to those standards. Notice how the column headers have changed to show the Assessment Name underneath the standard numbers. Detail: All Assessments & Average: Displays performance levels for the selected standards on every assessment aligned to those standards and calculates the average percent correct for each standard. Note the addition of a column labeled Standard Average underneath the standard numbers. Key as Filters: Each Performance Level can be used as a filter. The default view is for all Performance Levels to display in the student results. View results for only one Performance Level for any assessment choice by unchecking the boxes of the other levels. Individual student performance can be viewed as a bar graph. In the same row as the selected student, click on the chart icon under the View Charts column. 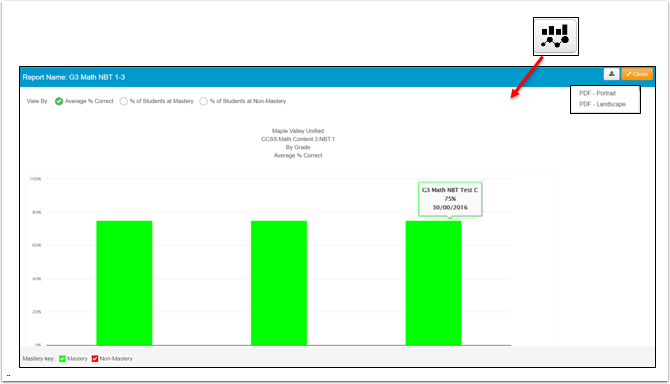 A bar graph will automatically populate showing the percent correct for each standard compared to the mastery value, color coded as indicated by the Key. Hover over each bar to view the percent correct and raw score. Click on the Download icon to export to PDF. Click on Close to close the graph and return to the report. View the student results in performance levels. The Summary View displays overall performance By Grade or By Period (Teacher Level User), By Teacher, Grade, or Period (School Level User), or By School, Grade, or Teacher (District Level User). Each can be viewed with the Latest Assessment, All Assessments, or All Assessments & Average. Mastery/Non-Mastery: Based on Mastery Value. Show %: Option to include the percent of students in each level, Mastery/Non-Mastery. These values display beneath the colored bars. Hover over each bar to view the percentages. Time Spent: Option to include the average time spent on items in each standard. # Tested: Option to include the number of students tested. Results: School District results, and Grade Level results for each standard. Click on Grade (in blue font) to drill down to Teacher Name. For secondary classes, click on Teacher Name to drill down to Periods. View Summary Graphs by Standard by Mastery/Non-Mastery: Click on the Graph icon to view graphs of the summary results by standard. There will be one graph per standard with display options. View by Average % Correct, % of Students at Mastery, or % of Students at Non-Mastery. 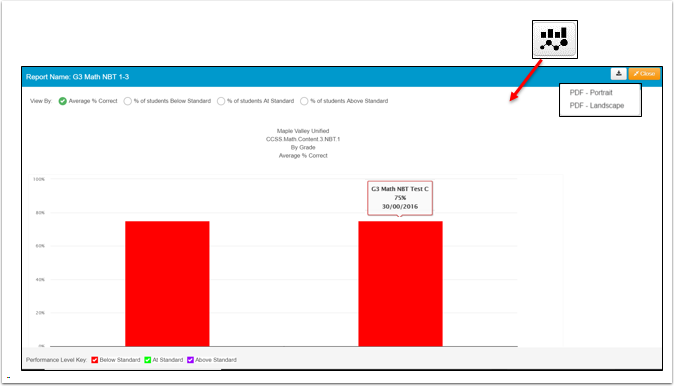 Hover over each bar graph to view the Assessment Name, Average % Correct, and test date. Note that the graphs may be exported to PDF. Summary: By Performance Levels: View student results by Performance Levels. View Summary Graphs by Performance Levels: Click on the Graph icon to view graphs of the summary results by standard. There will be one graph per standard with display options. View by Average % Correct, % of Students Below Standard, % of Students At/Near Standard, or % of Students Above Standard (depending on Performance Level descriptors). 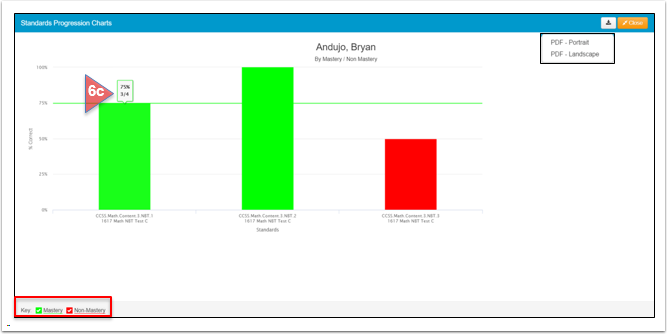 Hover over each bar graph to view the Assessment Name, Average % Correct, and test date. Note that the graphs may be exported to PDF. From the Report Manager, click on the Standards Progression tab. Select the correct Report Year. Select the Subject from the drop down list. Click on Save to save your work for later, or click Next to go to the next step. Your work will be automatically saved. Return to Standards Progression Reports list, if needed. Select the desired Standards set. Note that more than one Standards set can be selected. The report allows for mixed subjects (for example, Math and Science). Select the Domain and standards will populate on the right. Select the desired Standard(s) by checking the box next to the standard number. Click on Previous to return to the previous step, Save to save your work for later, or Next to go to the next step. Your selections will be automatically saved. Selected Standards: View the standards selected in the previous step. Open the green circle with a plus sign to view all assessments aligned to the selected standard. Remove an assessment by unchecking the box next to the assessment name. This will remove the assessment from the report, but it will remain on the list to be added later if needed. Click on the orange circle to close the assessment information. 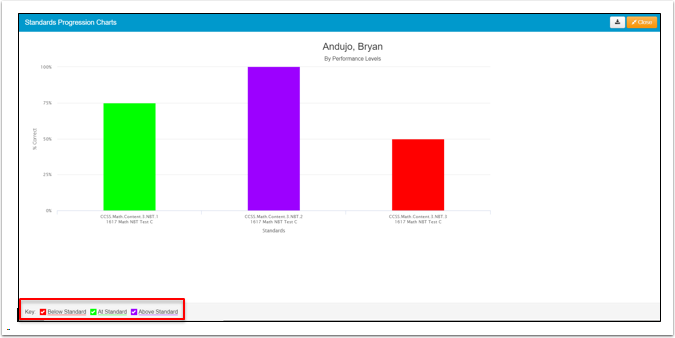 Display Column: Add columns to the report Grade, School, Teacher, Period (options depend on User Role). Demographics: Select demographics to add to your report. Options will vary depending on the data each district collects. Automatically Update: Slide No to Yes to add newly administered assessments aligned to these standards to this report. Check the box next to the level(s) of assessments that should be automatically included (My Assessments, School, District, etc.) These selections can be further refined by restricting specific Collections or Tags. When all selections have been made, click on Previous to return to the previous step, Save to save your work for later, or Save & Run Report to view the new report. The new Standards Progression Report will be listed under the Standards Progression tab in the Report Manager. Use the icons under Functions to View (eye), Edit (pencil), Copy (2 pages), or Share (square with arrow) with other Users as permissions allow. Use the drop down arrow do Delete the report, Rename it, or view its History.